This week’s blog post brings well-deserved attention to The Goring’s resident expert, John Andrews. 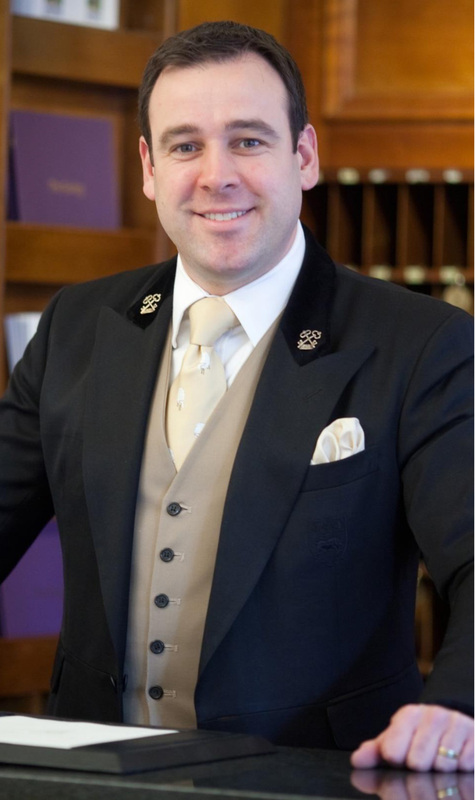 He is a much-loved member of the hotel team and knows London better than anyone. Keeping a finger on the pulse of what’s hip and happening in the city and its environs, Big John (as he is affectionally known) recommends everything from fabulous shows in the West End to the latest museum exhibits, from behind-the-scenes attractions in Harry Potter’s world to award-winning dining. Read on to learn more about one of our very favorite travel treasures. 1. What motivated you to become a concierge? And what drew you to The Goring? My godfather was simply the best head concierge in London, and worked at The Churchill Hotel, back in 1988. He was my father’s best friend and he kindly offered me three weeks’ work experience during my final year at school, at the age of fifteen. After completing this, he then offered me a full-time job as a pageboy when I left school at sixteen. How could I resist? He was, and still is, a huge ambassador for the hospitality industry — he inspired, encouraged and motivated me to one day become a head concierge in one of the finest hotels in the world. My journey to The Goring: It’s been five-star all the way for me! I left school in 1988 and joined The Churchill Hotel as pageboy/messenger and then progressed on to luggage porter. After completing three years of service, it was time to move on. In 1990 my godfather put me forward for the position of junior concierge at The Berkeley Hotel, which was then part of the Savoy Group. Over the seven years that followed, I trained tirelessly to become a fully trained concierge. Then, one day out of the blue, I received a phone call from my godfather to say that he was putting me forward for a position at another fabulous London property. In 1997 I moved to The Lanesborough Hotel and was finally honored with my “keys” and became an official member of the Clefs d’Or Society (The Golden Keys). I worked for eight years as a concierge and in 2005 I received a promotion to assistant head concierge. I held this position for a further three years and in 2008 my then head concierge was asked by Jeremy Goring if he knew of any potential head concierges as he was looking for new one. To my astonishment, my head concierge said there was only one person fit for the job, and that was me! My dream finally came true when I was offered the head position at the famous Goring Hotel. This unique, privately owned, five-star luxury hotel, which has stood proud for over a century in the heart of London, became my home. It fills me with great pride to be able to give my 29 years’ experience to a team of amazing people with whom I work and strive to provide the ultimate guest service and to become a proud figure in The Goring’s history. 2. What are some of the most unusual requests you have fulfilled? I had an American guest who confessed to being obsessed with cats! After showing me an article about a white cat nicknamed Macavity that had taken to using the 331 bus each morning, she asked me to find out if the story was true. This feline was purported to catch the busy Walsall to Wolverhampton bus at the same stop practically every morning, whereupon he would get off at the next stop in search of food scraps at a fish and chip shop. After making numerous phone calls, I finally made enquiries at the local bus depot and was told that the story was indeed true. As soon as my guest heard the news, she shrilled with delight and insisted I arrange a chauffeur transfer every morning at 5 AM to take her to Walsall to wait for the cat. On the third day, several hours of traveling and hundreds of pounds later, her wish came true, as she finally managed to travel on the 331 bus with Macavity the Cat. One very happy guest! I also once had a bride who had a glass of red wine spilt all over the bottom half of her white, full-length wedding dress. This happened after her church service and just before the wedding breakfast to which guests were returning from the ceremony. The hysterical bride insisted I arrange for our in-house valet to simply cut the bottom of the dress off and make it a knee-length dress, whilst she was still wearing it. After cutting through her £25,000 dress, myself and the valet had around 15 minutes to hand tack the dress to an even edge. She was so concerned that her guests would wonder what had happened to her dress, so I advised her to simply say she had decided to remove the top full tier of her skirt as it was far too heavy to wear for the entire day. 3. What is the most over-the-top indulgence you have fulfilled? I arranged a complete surprise marriage proposal for a gentleman and his girlfriend. He wanted me to come up with a unique idea, plan it and just tell him where they needed to be and what he needed to do on the day. The only stipulations were that it must include their three favorite songs and it had to happen on the first day of their arrival in London. He was so nervous he could not wait to get it over and done with! A Rolls Royce Phantom will meet the two of you at Heathrow @ 8:45 and transfer you to The Goring. I have arranged to have your suite ready for your arrival. Whilst your girlfriend is freshening up you will need to come down to the lobby at 11:00 sharp, where a member of staff from your chosen famous jeweler on Bond Street will meet you to hand over engagement ring. You will both need to leave the hotel by 12:45, take a romantic stroll through St. James Park, towards the London Eye. Please make sure you walk across Westminster Bridge and be at the London Eye Priority Desk by 13:45, latest. A “Private Capsule” on the London Eye is confirmed in your name 14:00. There will be a bottle of Goring Ayala champagne waiting to be enjoyed during your flight. There will be a flashmob of nine singers and a guitarist waiting at the desk to check in, along with a photographer. A host from the London Eye will also board with you all, who will be serving the champagne throughout your flight. The total number of people boarding will be 14, including the two of you. I have made arrangements for the flashmob, the guitarist and the photographer to arrive at 1:30 to enable them to have enough time to liaise with the desk staff, as well as the London Eye host before your arrival. This way they can all ensure that everyone is on the same page and to remind all concerned that it is a complete SURPRISE! I have provided everyone concerned with the photo of you so they will know who you both are. The “London Eye Host” will start offering the champagne to everyone on board the flight. To make absolutely certain everyone on board knows exactly who you both are, the flash mob and guitarist will decline the offer of champagne. You both must accept a glass each, which means you will be the only two drinking on board and there will be no confusion as to who the special couple are. The flashmob will randomly start singing “Something” by the Beatles around 11 minutes into the flight. This will not be directed at you but once the song is finished the flight should be at the position of midnight. They will then turn towards you both and pull out a card each (I have had these made and passed them on already). Once you see them pull the cards out displaying “Will You Marry Me …?” You can then pop down on bended knee and ask the big question. The photographer will start clicking to capture the occasion. The flashmob will then continue singing “Stand by Me” and lastly “Your Song” by Elton John for the remainder of the flight. The Rolls Royce Phantom will be waiting to meet the two of you in Chicheley Street (behind the London Eye) @ 2:30 and take you on a romantic drive through central London. You will return to the hotel where the staff will be lined up to cheer and welcome you both. Your footman will be waiting at door of your suite, which will have been filled with 12 dozen red roses. After the footman has served you your Crystal champagne and chocolate- dipped strawberries, he will depart the suite and hang the “Do Not Disturb” sign on the outside. Mission accomplished! 4. 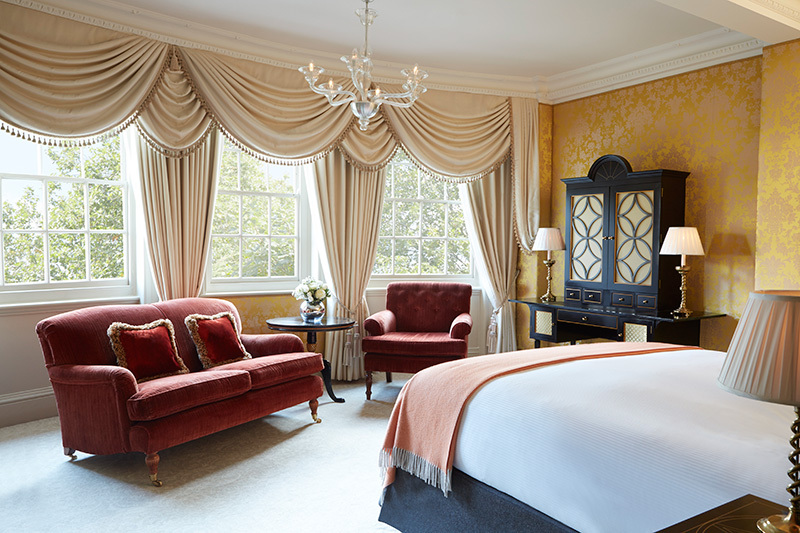 What is your favorite room at The Goring and why? It has to be Room 98, one of our Most Splendid Rooms. It has beautiful, calming-colored Gainsborough silk-lined walls with a fabulous view of our private garden. The bathroom has stunning handpainted koi carp wallpaper. 5. What three things do you never travel without? A picture of my wife and children, aftershave and handkerchief. 6. What destination(s) is/are you longing to visit? The Maldives, South Africa and Australia. 7. What are your favorite under-the-radar sites in London for jaded travelers? Sky Garden: Located on Fenchurch Street, right in the heart of the city, this beautiful venue caused quite a stir when it launched back in 2015. Zip up 35 floors of the Walkie Talkie’s shapely layers and you’ll be transported to a public garden with some truly spectacular views. Sky Garden boasts three storeys of landscaped gardens lush with South African and Mediterranean plants, observation decks and an open-air terrace. The Foundling Museum: The Foundling Hospital was opened by Thomas Coram in 1739 to care for babies that were at risk of abandonment. When its last pupil was placed in foster care in 1954, it had raised and educated 25,000 children. Trace the sad histories of these little lives, see the desperate mementos left by mothers forced to hand over a child they couldn’t care for and find out how artists like Hogarth and Handel helped establish the first children’s charity and first public art gallery. London’s Roman Amphitheatre: The City of London holds many surprises. One of the best can be found in the basement of the Guildhall Art Gallery. Free to visit, there is a walk-in excavation of an amphitheatre that was built when this was Londinium. Light displays also offer a chance to get a feel for what this sporting arena would have been like in action. Wallace Collection: This grand old townhouse is full of treasures from the days when the super-rich really did know how to shop. Ceramics, furniture, armoury and artworks (including Frans Hals’ “The Laughing Cavalier”) can be seen in its 25 galleries. 8. Besides London, of course, what is your favorite city to visit? Hong Kong is just amazing! 9. Whom would you invite to tea at The Goring, living or passed? John Whitaker, a British Equestrian and Olympian. 10. What is most worth the splurge when staying at a luxury hotel or resort? Two things really: to have a suite with a footman on hand, and in-room dining to have breakfast in bed every day. 11. What is your favorite cocktail at The Goring bar? The O.R Champagne cocktail, which contains sugar, Angostura Bitter and Grand Marnier topped with Ayala champagne. 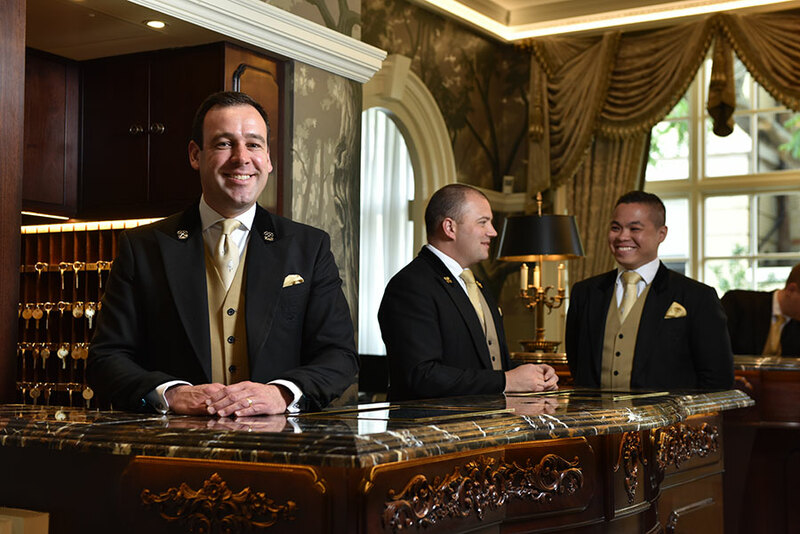 Our many thanks to the incomparable John Andrews, Head Concierge at The Goring in London.